Sony also unveiled at CES2014 a new 4K video camera which is a quarter the size of their first 4K Handycam. At Digital Camera Warehouse we will soon be accepting pre-orders on the new Sony FDR-AX100E Handycam with stock available on Australia shores and in-store from May. 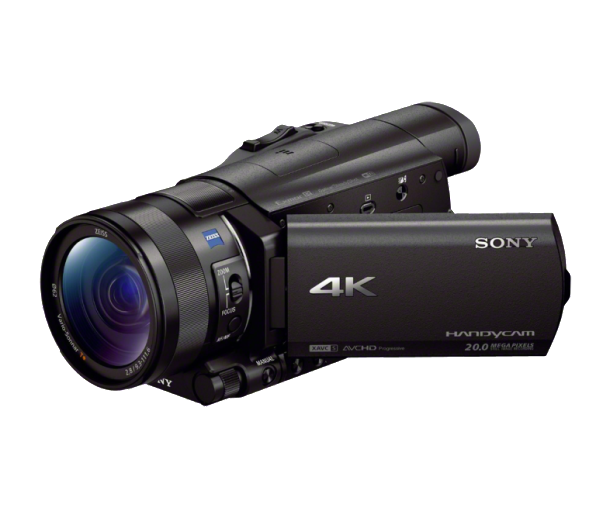 The Sony FDR-AX100E is the first 4K Handycam that features a large back-illuminated 1.0-type Exmor R CMOS sensor, which helps capture flawless 4K Ultra HD images with four times the detail of Full HD. All of this is achieved while also allowing amazing ‘bokeh’ background blur effects. The 4K sensor is paired with Sony’s ultra-powerful BIONZ X processor that employs area-specific noise reduction and detail reproduction technology for incredibly vivid, lifelike footage that’s closer than ever to reality. The Handycam uses a newly-developed ZEISS Vario-Sonnar T* lens with 12x optical zoom that’s been fine-tuned for 4K shooting. Definition is superb right into the corner of the frame, thanks to the 11 group/17 element lens that incorporates AA (advanced aspherical) and ED lens elements. In another 4K Handycam first, Dual Video Recording lets you simultaneously record high quality movie clips and ready-to-share MP4 files. Capture movies in XAVC S (at up to 4K/60Mbps or HD/50Mbps) or AVCHD formats to view, edit and enjoy with the highest resolution. At the same time, a more compact lower-resolution copy of your footage is recorded in MP4 format. After shooting, just touch your NFC-enabled smartphone or tablet to wirelessly transfer web-friendly MP4 clips from the AX100E for quick online sharing. The 4K Handycam also includes 120fps recording capabilities that captures the action in HD quality (1280x720). Enjoy footage edited on your PC in silky-smooth slow motion – just like a TV action replay that shows every moment of that decisive penalty kick. The 4K Handycam comes with built-in Wi-Fi and NFC that lets you wirelessly transfer movie clips and photos from to your smartphone or tablet with a single touch through the PlayMemories Mobile app on your iOS or Android device. Wi-Fi also allows wireless playback of content stored on Handycam on your networked TV (DLNA renderer compatible TV and access point are required: not compatible with XAVC S format). Touching the Handycam with your NFC-enabled mobile device also activates Smart Remote Control. Start and stop recording with your mobile – it’s ideal for group scenes or solo performances when you don’t want to run from the camcorder back into the scene once recording’s started.